While exploring planet P3R-636, Daniel encounters Princess Shyla, the melancholy daughter of King Pyrus. He prevents her suicide attempt, but in doing so, SG-1 is captured as spies and forced to work as slaves in the naquadah mines. When Daniel is injured, Shyla nurses him back to health with a sarcophagus. She sees him as her "destiny", and Daniel hopes to use his favored position to negotiate the release of his team. But already he is becoming dependent on the sarcophagus, and when their release does come, Daniel faces an even greater battle at home to overcome his powerful addiction. Raw naquadah is highly valued among the Goa'uld. Samples of the element were brought back to Earth because of its countless potential military and scientific applications. 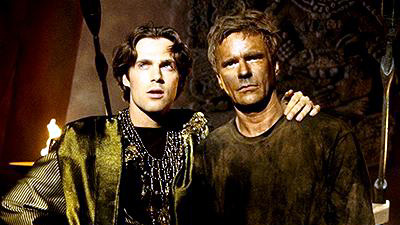 Pyrus the Godslayer became the ruler of the planet when he killed the Goa'uld who had ruled there 700 years ago. His people continue to imitate the ways of the Goa'uld to avoid detection. The sarcophagus can sustain and extend human life, but repeated use causes addiction. Daniel used it 9 or 10 times resulting in a narcotic effect, increasing adrenaline, endorphin, and hormone levels and causing physical withdrawal. The Tok'ra don't use the sarcophagus because of the side effects. It changes the mind and takes away "kalach" - one's soul. Since the experience with Jolinar, Carter can share some of Jolinar's memories and sense the presence of a Goa'uld. O'Neill implies experience with addiction. Hi-ho, hi-ho, back to work. If you keep using that sarcophagus, you're going Dark Side on us.